The internship is for positions either in the Retail shops or the Headquarters of the company with high hiring opportunities. 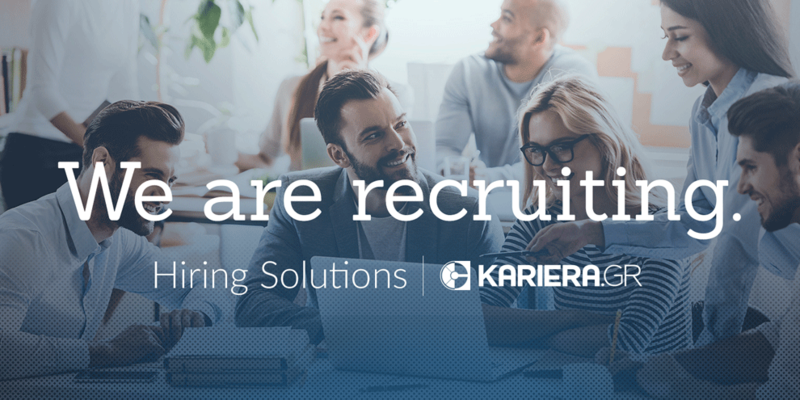 kariera.gr, the leading website for recruiting in the Greek job market, has an amazing inhouse team of young as well as experienced recruiters. Their job is your job. They are committed daily in sourcing the ideal candidates for hundreds of clients we service in the IT, Professional and Customer Experience sector. Once you apply for one of the jobs posted by Hiring Solutions our recruiters will do their absolute best to track you and with top-of-the-notch candidate experience empower you in the best way possible to get the job you want if you meet the requirements. As a proud member of the CareerBuilder organization, we empower employment through every product, service or initiative we produce and support. With more than 20 years of experience in the Greek job market, an extensive network of partners, continuous candidate surveys and the vast majority of companies operating in Greece being our clients, we have one clear mission: to match the perfect candidate with the right job. Συμπληρώστε το email σας για να ξεκινήσει η διαδικασία αίτησης και για να σας στέλνουμε όμοιες θέσεις με τη θέση Internship for ATEI students .